Are you considering buying something new for your wardrobe? A pair of slacks for work? A dress for church? A new blouse for your important meeting? What steps do you take and what information do you require before making purchasing decisions? Do you browse through the shops in the mall until something catches your eye? Something with a pleasing appearance that will look terrific on you? After you've found the potential item, is step two to glance at the price? If the price is affordable, you buy it; if it is too expensive, you don't? Is that all? Is that as far as you go? For many of us, appearance and cost are the only criteria we consider when shopping for clothing and household goods. In this regard, I can't tell you how many times I've heard lines like these from my customers: "I wish I'd known that before I bought it!" and "Well, how am I supposed to clean it?" and "I wasn't aware that the care label said..."
Expense does not necessarily translate to an equivalent level of quality. For example, you can spend $200 on a silk blouse, spill a drink on it the first time you wear it, ruin the color, and never be able to wear it again. On the other hand, you can spend $20 on a polyester blouse from the clearance table which will last five years. What is quality to you? Decide which serviceability processes you desire. If you want "dry clean only" garments, be sure to select the appropriate labels. 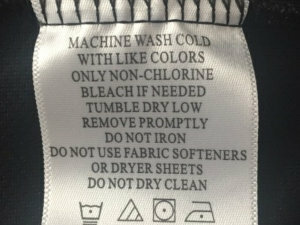 If you prefer to wash your clothes at home, I suggest you look for a "machine wash warm" label (if the label says machine wash cold, the dye may run in warm water) with "tumble dry" drying instructions (they come out of the dryer relatively wrinkle-free). Also, make sure to keep your current lifestyle in mind when choosing serviceability processes. Can you afford to dry clean your entire wardrobe? How many garments do you have the time and patience to hand wash? Do you really want to spend all weekend ironing? 1. Spot clean only - A garment with this label is not a serviceable garment and there are not many dry cleaners with the ability to do this. 2. Do not dry clean - A garment with this label probably has solvent-soluble dyes and/or trims. I've seen dark-colored cotton/rayon blend shirts with this label; it's not a problem - unless you drop a Big Mac down the front and need to have it dry cleaned! Also, be wary of beaded and/or sequined garments of various fabrics with this label. For example, I get a lot of cotton sweaters at Christmas with beads and bells, etc. and the instructions are to hand wash and lay flat to dry. HOWEVER, when you follow these instructions, the color may fade. In addition, without tumbling dry, a cotton sweater will feel hard and scratchy, not soft. 3. Do not wash - dry clean only - A garment with this label is only a "questionable care" instruction under certain conditions. Wool garments and garments with water-soluble dyes should not be washed; however, light-colored cottons, linens and silks should be able to withstand washing to clear wet-side stains and perspiration. Also, anyone with a bladder problem should never buy "do not wash" slacks. 4. Hand wash only - You must ask yourself why? Will the tumble action of a delicate wash cycle cause the dye to run, cause the fabric to shrink, or ruin the trim (beads, sequins, etc.)? And what does the manufacturer consider a proper hand wash? Two dips in the bucket? Four dips? Would six dips be considered "mishandling the garment"? After the garment is washed, how do you get the water out? Do you wring the garment with your hands? Extract the water out in your washer? The instructions don't tell you that. 5. Reshape and lay flat to dry - This instruction often goes together with hand wash only and is usually associated with sweaters and knits. The material dries hard and scratchy and the dyes can still run together. 6. Guaranteed to fade / guaranteed to stretch - These are disclaimer-type labels - don't even go there! 7. Garments without a label - These garments have "presumed" instructions based on the type of material. As with the above disclaimer items - don't go there either! TTBB garments with contrasting colors. That black and white blazer looks great now, but even if your dry cleaner processes it by itself, the white will eventually lose its luster, and will never look new again. TTBB suits with labels that don't match. I've seen suits that look perfect before they're cleaned, but don't match afterward. One piece made in Malaysia and one piece made in China. Or, one piece machine wash and one piece dry clean only. Or, one piece 100% cotton and one piece 60% cotton / 40% polyester. Be careful of all these types of combinations. Recently, I was at the counter conferring with a customer regarding a new black and white 100% rayon knit blouse that was manufactured in Italy. The care instructions were ASTM symbols that she didn't understand, and her question was this, "What is the best method to use to clean this blouse?" I explained what the symbols meant: do not dry clean, hand wash (30'C), do not dry (in dryer), lay flat to dry. Since dry cleaning was out, the only option was hand wash, and she decided to do that herself at home. I told her I believed the black was going to bleed into the white. She said if it did, she would take it back to the store. I told her to call the store BEFORE she hand washed it to get explicit instructions regarding this processing: exactly how many dips in the bucket, how to get the water out before laying it flat to dry, etc. "I sure wish I'd have known all this before I bought it!" I soon plan to have specific ratings for particular fabrics, household goods and garments relative to serviceability, durability and longevity; however, you can help yourself now by simply becoming a more discerning, better-informed buyer. Remember, if we consumers stop buying poorly made garments, they'll stop making them!